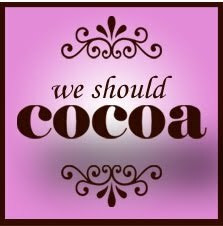 This month I have had the honour of hosting We Should Cocoa, a food blogging challenge by Choclette from Chocolate Log Blog. 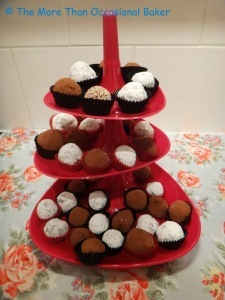 After some pondering I decided I would challenge you all to make and share your chocolates and truffles recipes, and you all certainly rose to the challenge! 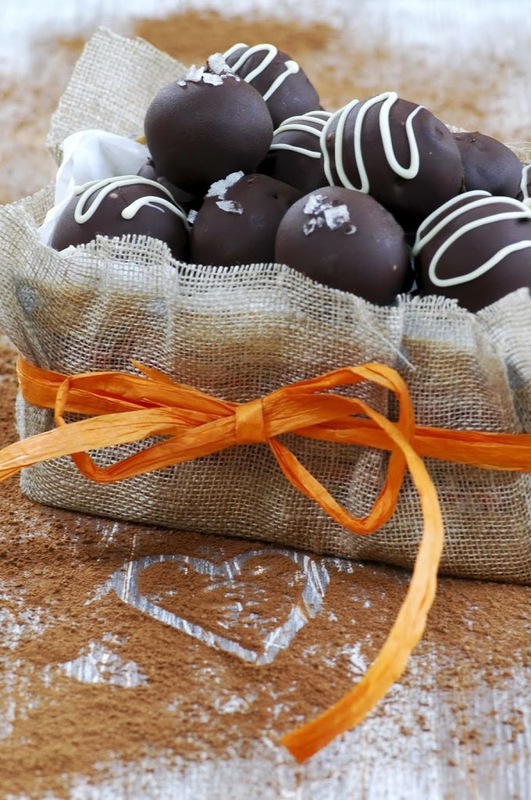 What a fantastic array of delicacies you have created, from gorgeous truffles, filled chocolates, chocolate coated caramels and other beautifully decorated delicacies, some with some rather unusual ingredients. So here we are; get ready to have your taste buds tantalised! Rebecca delicately flavoured a dark chocolate ganache with orange and cinnamon before cutting them into squares and dipping in tempered couverture chocolate and decorating with a gorgeous cocoa butter transfer sheet. Rebecca provides very detailed instructions on how to dip chocolates to get a nice edge and I wish I’d read them properly before I made my own entry! 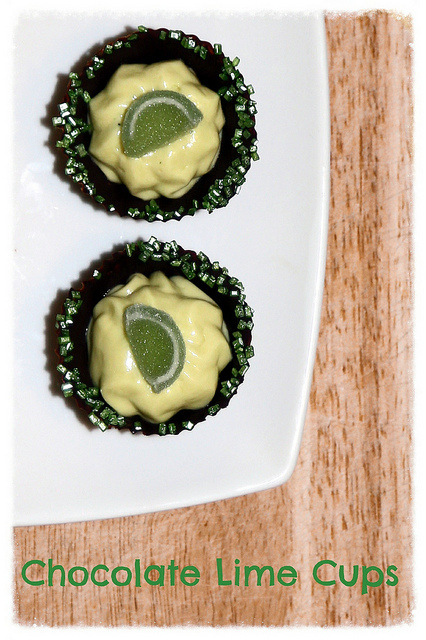 After some great ideas about making chocolate limes and a few unsuccessful attempts at making a vegan marshmallow, Rachel filled dark chocolate cups with a whipped white chocolate ganache tinted green and flavoured with lime. I think the glitter sugar around the edges is lovely, and the combination of white chocolate, dark chocolate and lime sounds divine! Janet whipped up these vegan no bake treats using dates, peanut butter, cocoa powder and coconut flour. Personally I think that chocolate and peanut butter are a marriage made in heaven, and I think these gluten and refined sugar-free morsels sound like the perfect quick late night chocolate craving satisfy-er! 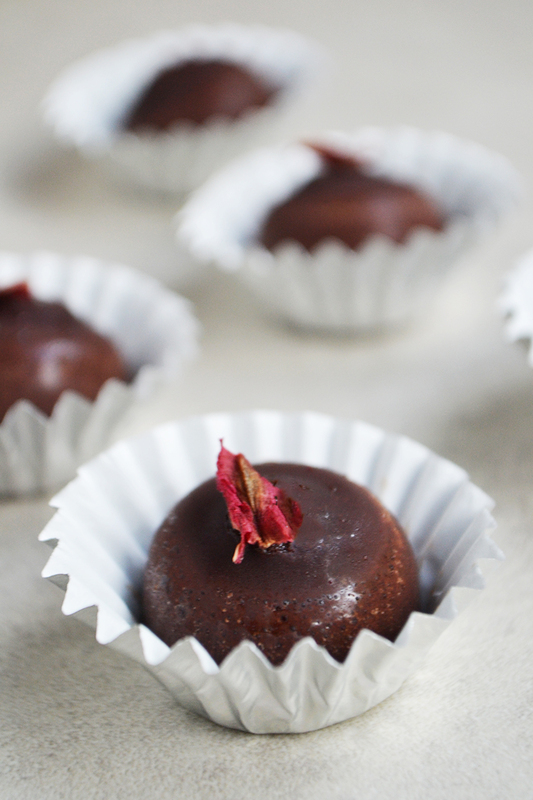 Inspired by the beautiful recipes and photographs in a cooking with flowers recipe book, Aimee decided to coat a raw hibiscus and goji berry truffle centre, made soft by the addition of creamy cashews, with a cacao coating. Not only do they look divine, they’re good for you too! 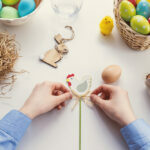 Angela never fails to impress with her blog posts. Delicious recipes combined with beautiful photography always make for a great experience. 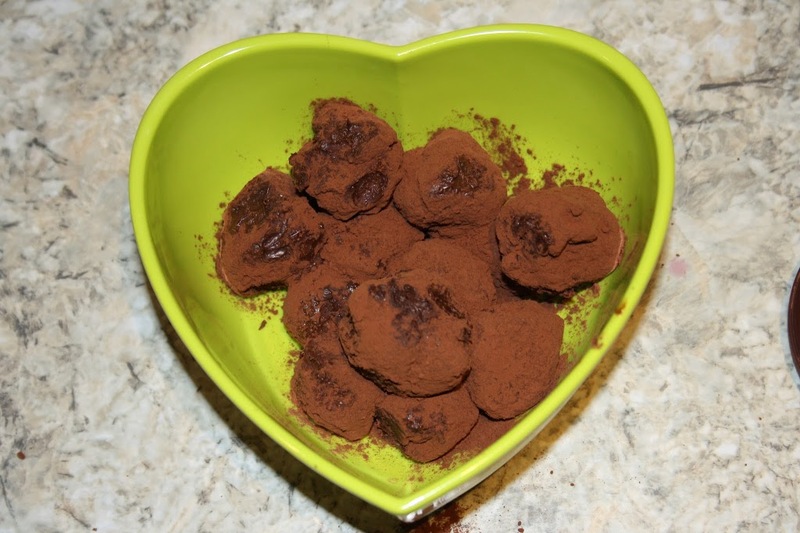 These truffles use avocado to impart a creamy consistency to the truffle centre which is much healthier than the traditional cream version, she says. They’re then dipped in dark chocolate for the ultimate taste. Jen’s entry this month is a 4-for-1 affair! 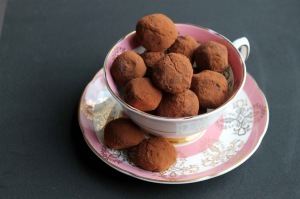 Her special ingredient for these gorgeous sounding truffles is speculoos, and she makes her own blend. It is then used in cookies and a spread (both recipes are provided) which is then made into gorgeous truffles which she bakes inside a chocolate fondant! Heavenly! I’ve never tried speculoos but after reading Jen’s post I am very tempted to. If I’ve said it once I’ve said it a thousand times – chocolate and peanut butter are a marriage made in heaven. They’re one of my favourite food combinations and Ros combines them superbly in these beautiful truffles made with cream cheese. Three ingredients, that’s it! Fantastic! 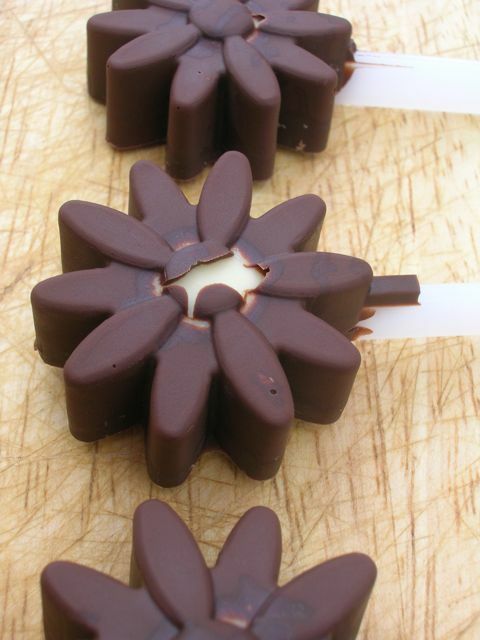 Choclette, the brains behind We Should Cocoa, thought she’d try out some flower moulds given to her as a gift for this months challenge. Using her favourite flavour at the moment: salted caramel, Choclette made these wonderful looking chocolates with salted caramel almonds (yum!) and white chocolate buttons as the flower centres. I think they look superb! 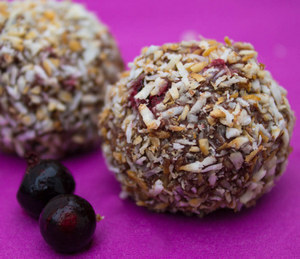 Inspired by the memory of my grandmother’s freezer coconut chocolates I developed this recipe as my own entry to this month’s challenge. There is a special ingredient which you’ll never guess, but you’ll have to go read the recipe to see! 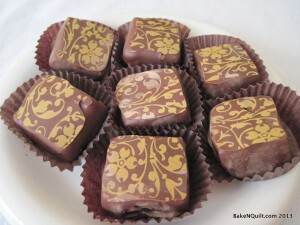 These chocolates have the taste and texture of a Bounty chocolate bar. 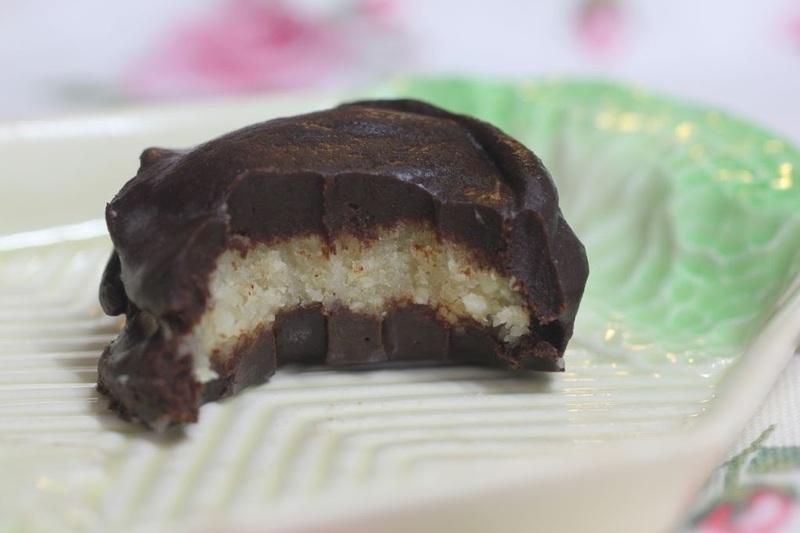 Joanna also made peppermint chocolates for this month’s challenge, but this time they’re made with a refined sugar-free creamy cashew coconut filling flavoured with peppermint. She even makes her own chocolate to coat them in with coconut oil, cocoa and maple syrup. They look very tempting indeed! Kate combines cooked beetroot puree with dark chocolate and smoky lapsang souchong tea into these very posh truffles which were featured in the Guardian readers recipe swap last week! Well done Kate! 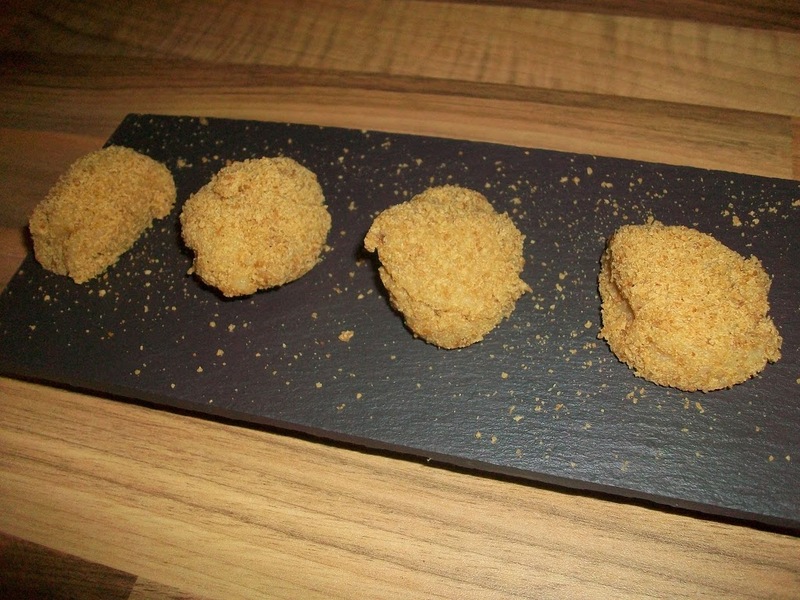 I reckon since these truffles contain cooked vegetables they definitely contribute to ones 5-a-day. 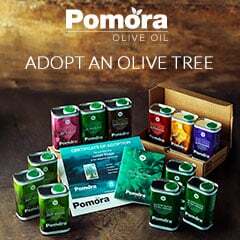 Pass some over please! Based on the Swedish chokladbollar, The Nutty Tart made a gorgeous chocolate chewy oaty treat for her entry to this month’s challenge. I’m a big fan of the Swedish chocolate balls and her version sounds very tempting, especially with the addition of coffee. Mmmmm…. coffee and chocolate, perfect!! 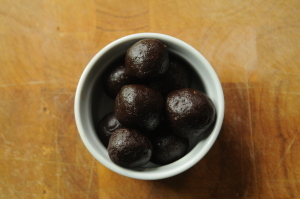 Fiona shares with us a delightfully sin-free low calorie rum flavoured chocolate truffle made with zero fat quark. 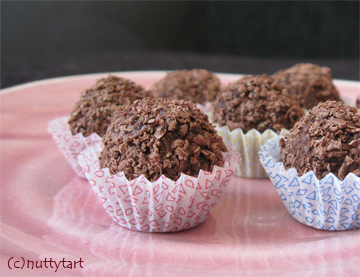 Each truffle is only 18-20 calories (16 if you omit the rum) so it’s perfect for those 5:2 fast days! 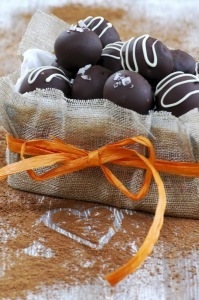 I have to admit to eyeing up a package of Quark the last time I did a supermarket shop with these truffles in mind! 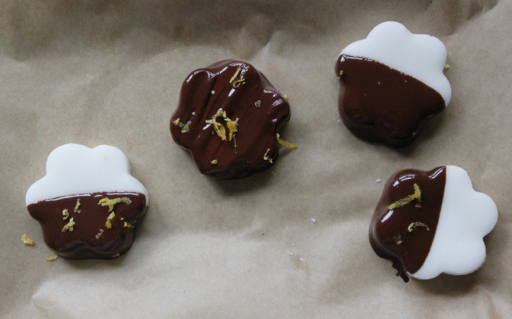 As snowy says in her blog post: “They’re not the most glamorous looking chocolates, but they taste heavenly. 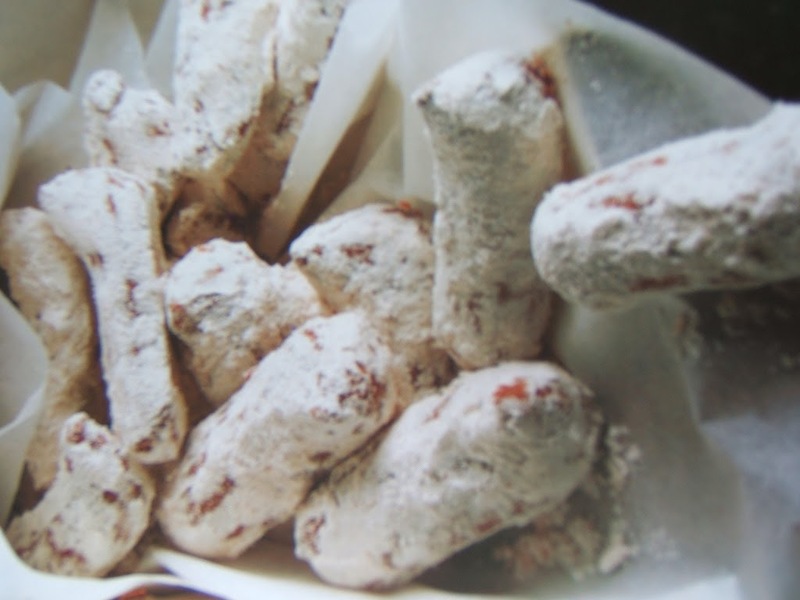 Cream, chocolate and cinnamon – what’s not to like!” Double cream and dark chocolate are flavoured with cinnamon and then piped into shapes before being rolled in icing sugar. They sound like the perfect addition to any chocolate box! Caroline brings us another sin-free chocolate delicacy (well, not exactly, they work out to be 3.5 syns each!). Caroline’s chocolate is flavoured with Chambord black raspberry liqueur before being mixed with half-fat soured cream and rolled in cocoa powder. Who says low calorie doesn’t have to be indulgent? These sound amazing! 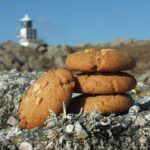 A great big thank you to everyone who shared a recipe this month. 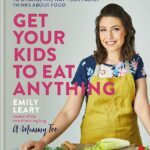 I really enjoyed hosting the challenge and although I set you a fairly tricky challenge theme you all shared wonderful recipes for it. Thank you! Do keep an eye on Choclette’s We Should Cocoa page for next month’s challenge host and theme! 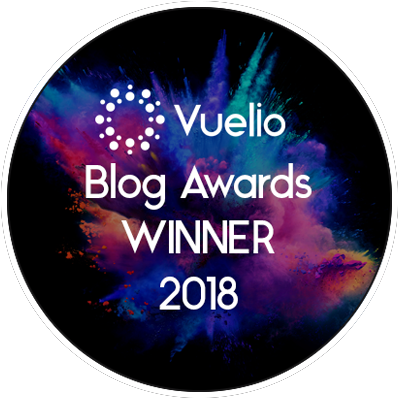 A great round up, some really fantastic entries here, even though it’s nearly time for bed I’m feeling peckish again looking at all this chocolate! Thank you Jen 🙂 Isn’t it a wonderful selection! I’m delighted at how varied the entries are too. hehehe the catch with the quark truffles is that they are really very good. 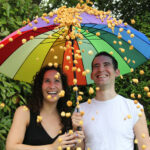 Result – some of us try to eat them…in large quantities! I’ve now picked up some Quark – you’ve inspired me! 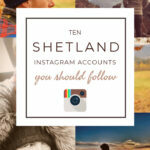 I’m pretty sure that I’ve put on weight just looking at all these gorgeous entries! Always such a wide range of inspiring ideas, well done everyone! I know I put on weight writing this round up! Haha! Thanks for the challenge, Elizabeth! Thank you so much for hosting Elizabeth and doing such a splendid write up. These chocolates are fantastic and I’m very keen to try all of them of course. It was good to see “healthy” chocolates make such a good showing. 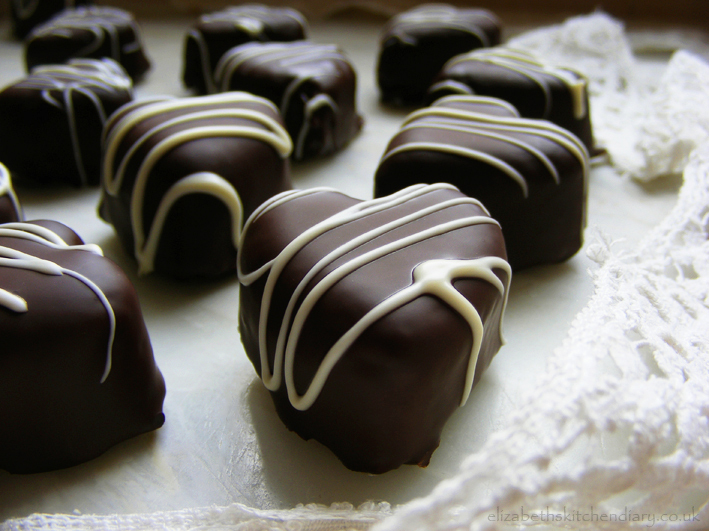 As well as generally craving chocolate now, I’m really wanting chocolate and peanut butter truffles in some form or other. It was my pleasure! I really enjoyed it and I think everyone did so fantastically well with their recipes. I’m delighted! I could go some chocolate peanut butter combo now too! I was feeling guilty about not entering, but I see you had loads of entries, they all look superb, must bookmark for seasonal gifts. Thanks Dom, and no worries – there are plenty of blogging challenges out there to keep one occupied/inspired! Don’t they! Everyone’s done so well with this challenge theme, I’m delighted!